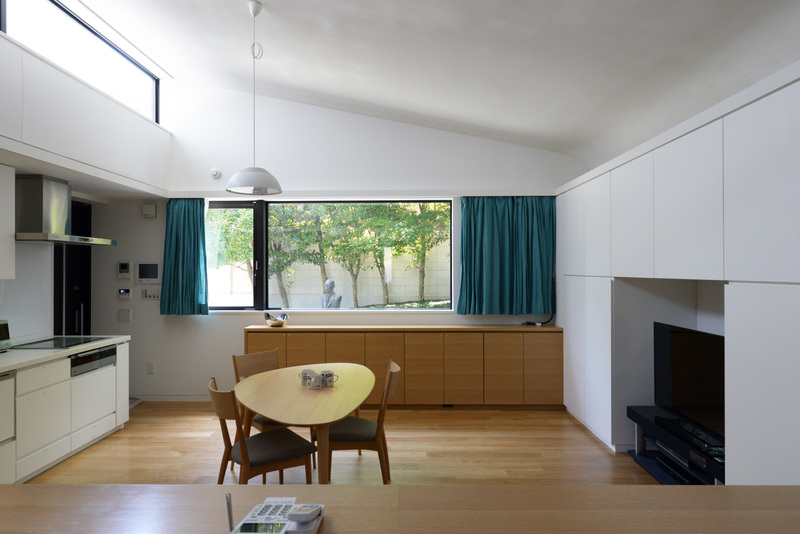 A wooden house for a couple who wants to continue independent living in a familiar environment. After completing the new house, their son’s family will move to the house next door where the couple lived for several decades. The elderly couple has requested the house to be one big space where they can keep an eye and care for each other. Not too big, not too small. Comfortable with the weather and temperature shifts was another key request as the summer heat can be quite severe in Tokyo. 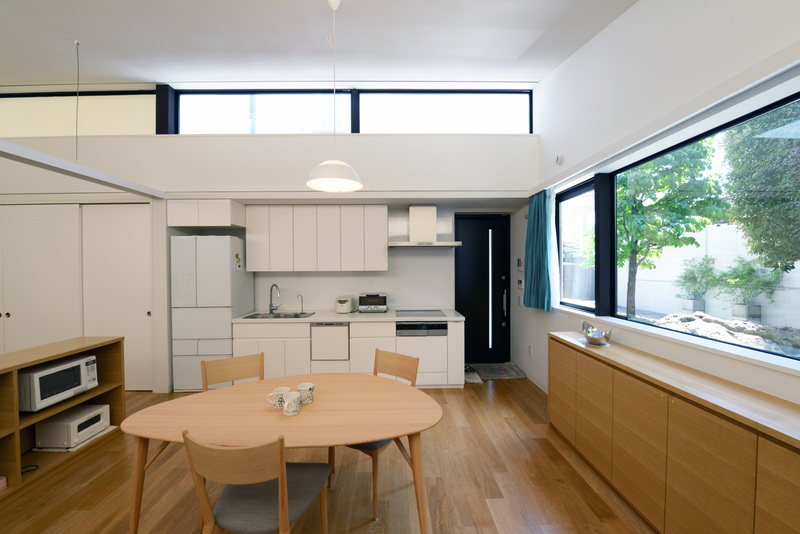 The floor plan reflects their desire to live independently as long as they could. For those who have spent a long time at home, what kind of aspects should we consider? The challenge was to design the house for those of different way of living and stage of life than mine, so I had to be imaginative. Since it locates in an affluent area, security is another essential factor. We devised the arrangement of external fittings, lighting equipment, and alarm to balance the connection with the outside environment such as brightness, warmth, and ventilation, and contradicting conditions of securing while preventing gaze and invasion from the outside. Also, they requested to be able to “see” whether if the other house is active without intruding their own time and lifestyle. 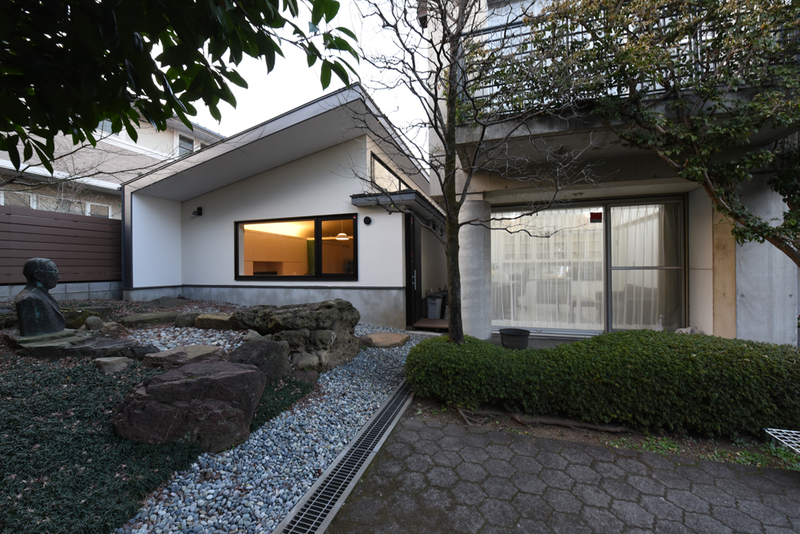 By arranging the high windows of the new house and the window of the staircase room of the house where they originally resided, we made it possible to create this “checking point” for each other. If the light was lit at night, it means that they are safe and sound. If not, it needs to be checked. The wife wanted the house to be able to watch and care for each other in case of emergency. It is essential for the elderly couple to notice the time of distress immediately so that they can respond promptly. On the other hand, one can be with someone for so long. 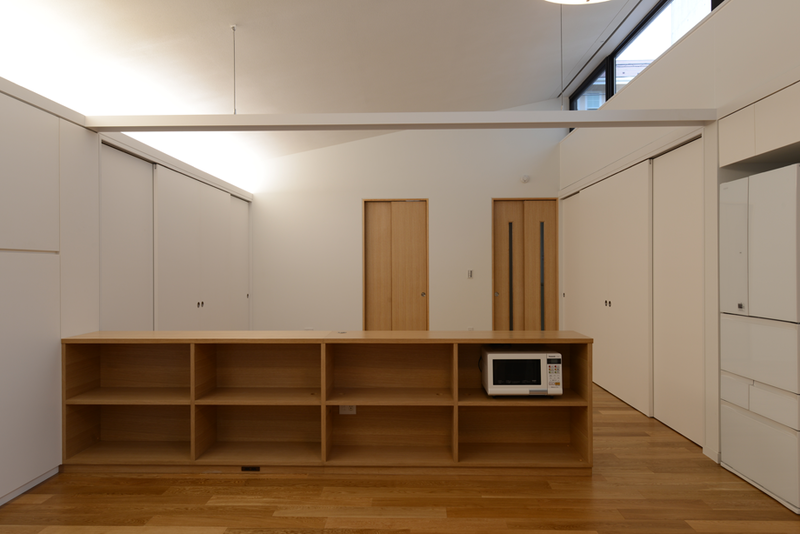 In case of needing space from each other, the former residence’s study was utilized as a couple’s room. We intended that by securing one room, one of them could get in and out now and then. This arrangement is a very realistic. It is the couple’s wisdom from their long-lasting marriage. Personally, I never felt the need to get away after I got home just yet. However, depending on physical and social situations, as we get older, the time to spend home increases dramatically and the need for personal space becomes more critical. Another request was to avoid direct contact of air-conditioned wind to the body. A thermal environment that emphasizes radiant heat rather than air conditioning was sought. We incorporate radiant panels under high windows, obstructing cold air from high windows during winter, intending that cool air from the ceiling will come down in summer. Also, the couple’s difference in feeling the thermal environment was another aspect that needed to be equally balanced. One might feel hot whereas the other feels cold. How did we address this issue? By locally arranging and using heaters and electric fans. We decided to solve the problems of such as “hot” and “cold” respectively. We adopted regenerative hot water floor heating because of its long residence time and the need for the uniform temperature throughout the house. This makes it possible to install floor heating even in bathrooms and toilets. To be able to access anywhere with a wheelchair, we made a turnable pathway width of 800 mm. 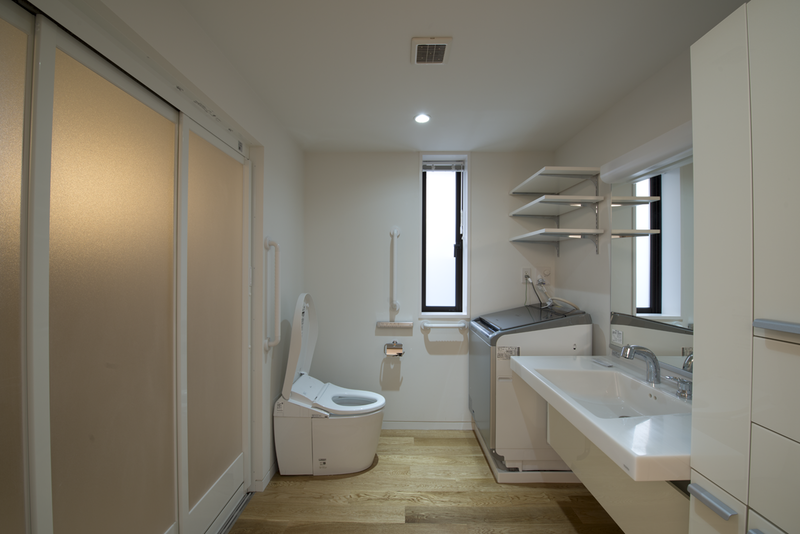 The washbowl and the bathroom were designed as a spacious area, so anybody who needs assistance can fit and work comfortably. 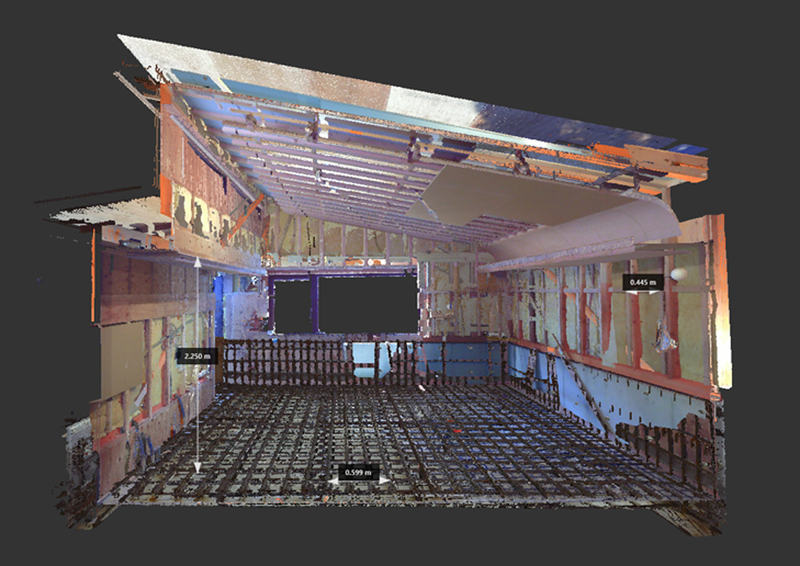 3D scan was carried out for 14 times during construction. The 3D data shall be utilized for maintenance and management. 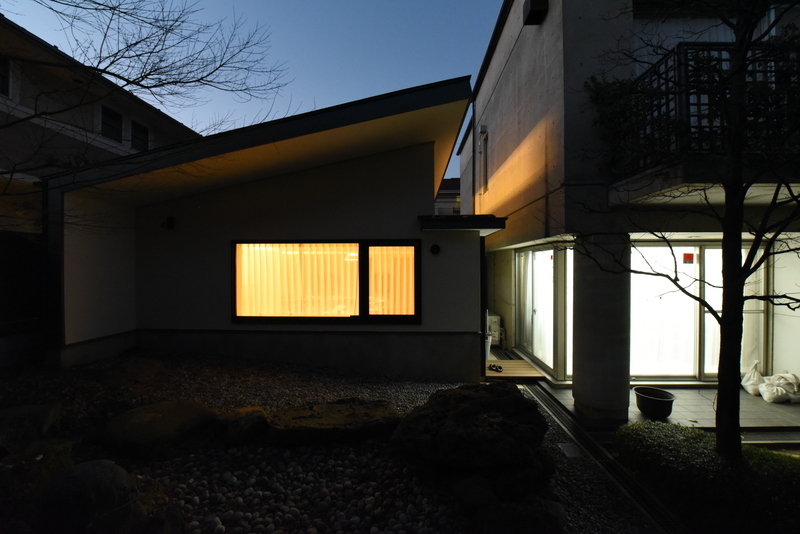 House in Yakumo is the clients’ third housing project. It doesn’t happen so often to be able to work with such an experienced homeowner. Their motto was “to leave the architect alone and let them do the work without too much input from the client.” Such a rare breed nowadays. However, it was up to us to figure it out the requirements and challenges of the project. Therefore, I repeatedly ask myself questions such as “are you sure you can provide something that is truly appropriate?” It was such a unique design process that is entirely different from the conventional process of responding to the request of the owner. I reminisce till this day; it was a memorable project.